OVER EASTERN AFGHANISTAN—Parachuting a barrel of fuel to a remote Afghan base takes sharp flying skills, steady nerves and flawless timing. “We’re going to burn a lot of gas to drop a lot of gas,” said Capt. Zack Albaugh, a California Air National Guard pilot deployed with the 774th Expeditionary Airlift Squadron. He spoke just before a recent mission to supply a remote base near the Afghanistan-Pakistan border, scene of cross-border rocket attacks that have heightened regional tensions this fall. Such security issues were addressed Monday at an international meeting over Afghanistan in Bonn, Germany, where President Hamid Karzai appealed for continuing international funding well after most coalition forces withdraw in 2014. But for now, nearly 100,000 U.S. troops are on the ground in Afghanistan, often stationed in difficult-to-reach outposts that depend on pallets of food, water, ammunition and fuel that are dropped by parachute out of cargo planes. Capt. Albaugh’s recent supply flight over the country’s Paktika province underscored a simple fact of the U.S. military presence: War is inherently costly, and that is keenly felt when the military’s budget is under growing strain and vital supply lines come under pressure. That happened last month when Pakistan closed key border crossings to North Atlantic Treaty Organization supply convoys following a deadly coalition airstrike that claimed the lives of 24 Pakistani troops. The crossings remain closed. The astronomical expense represents the “fully burdened” costs of fuel, including transportation and security. The cost and difficulty of fuel deliveries in places like Afghanistan is one major reason the Pentagon is working to overhaul the way the armed forces use energy, from developing aircraft that can run on biofuels to powering remote bases with solar panels or wind turbines. But those efforts are in the early stages, meaning troops still require expensive—and hair-raising—cargo flights to keep them flush with gas. On Capt. Albaugh’s run, two C-130 cargo planes flew in close formation, hugging the Pakistani border as they circled toward their target. The drop zone—the general area where the troops will pick up their cargo—was about the length of three football fields. Within that zone, the crew of the C-130 aimed to hit a smaller target: 60-feet-by-150 feet. The planes dipped over the landscape, laden with pallets of fuel. A small parachute deployed from each C-130’s cargo door, sending 34,000 pounds of fuel clattering across the loading ramp, like the Coney Island Cyclone. In the sky, parachutes blossomed, and the crates floated to the ground below. Aircrews based in Afghanistan fly missions around the clock to keep troops on the ground supplied. “We’ve been pretty busy,” said Capt. Jose Ariza, Capt. Albaugh’s crewmate. The sheer volume of air-dropped cargo is swiftly rising. In 2005, Air Force planes dropped around two million pounds of supplies to troops in Afghanistan. Last year, they delivered around 60 million pounds by airdrop. By the end of this year, officials say, they expect to drop around 90 million pounds of food, water, ammunition and fuel to bases in the country. Air Force Gen. Raymond Johns, who heads the service’s Air Mobility Command, said the December 2009 surge in U.S. troops has made resupply more challenging, particularly because of the threat of roadside bombs. This particular launch was successful: a total of 36 bundles reached the drop zone. But two parachutes did not fully open, and pallets stacked with barrels of fuel slammed into the ground, lost or badly damaged—”burned in,” as crews say. “That’s the cost of doing business,” said Lt. Col. Bill Willson, the squadron’s commander. 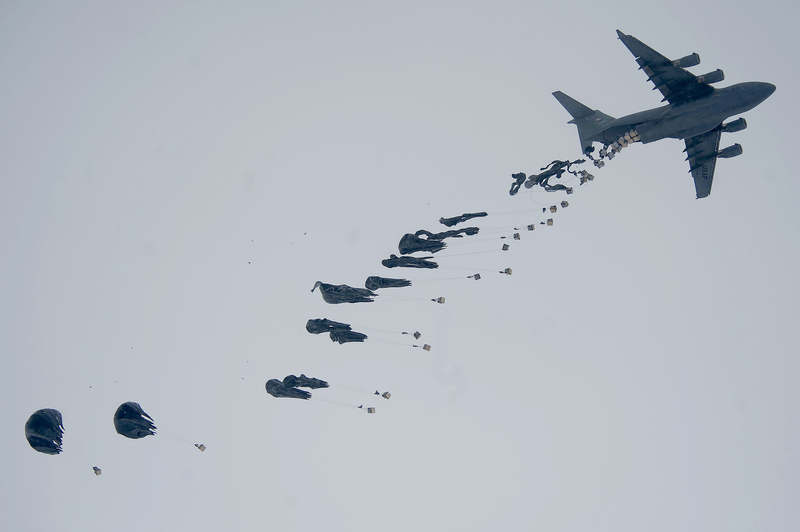 A single airdrop represents the tail end of a complex supply chain. The U.S. military has multiple routes to keep supplies delivered to landlocked Afghanistan, and had been working to reduce dependence on supply routes that go through Pakistan before last month border closing. Besides air drops and Pakistani delivery routes, the U.S. military can transport cargo overland through a road and rail network called the Northern Distribution Network, which brings non-lethal supplies in through Central Asia. But some supplies—certain kinds of weaponry or other sensitive cargo—must be moved by air. And that means Air Force planes will keep burning more fuel, and their crews will keep flying long hours. —Keith Johnson in Washington contributed to this article.